Episode 4: "Blind Man's Bluff"
Manny Ross, diamond smuggler, sends Tomar, his accomplice, to Los Angeles International Airport to steal a dog belonging to a blind man arriving from Mexico. On the same plane are Charlie Chan and his Number One Son, Barry. Outside the terminal, his master shot dead, the dog runs off and is hit by an oncoming car. Witnessing the accident, Chan asks for help to take the injured dog to a nearby veterinary hospital. At the hospital, Chan meets Juanito, a young boy whose dog was also treated there. The doctor tells Chan that the dog he brought in is not a guide dog as there was no foundation tag on the collar. Working with Lt. Norman of the LAPD, Chan notes that the dead man has certainly not been blind which is later proven correct. Late that night, Tomar breaks into the veterinary hospital in an attempt to steal the dog. Bitten in the process, the arrival of Barry Chan, who is conducting his own investigation, stops Tomar short of his goal. Pistol whipping Barry, Tomar makes his escape. At the hospital the next morning, Chan is informed that the dog's collar is missing. Calling Shiela, the nurse, he finds that the collar was given to Juanito. Suddenly, Tomar and Ross barge in, demanding the dog’s collar. Chan buys time by claiming that the dog that bit Tomar was rabid. Juanito's arrival at the hospital nearly alerts the smugglers to his possession of the collar, but it is upon the arrival of a talkative Barry that Tomar and Ross find out the truth about the collar and the falsity of Chan's rabies story. 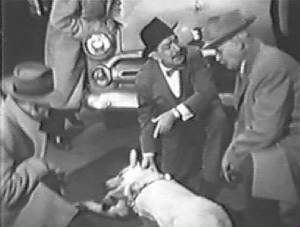 Angered at these revelations, Tomar, about to shoot Chan, is attacked by Juanito's dog, Senor Gordo. Overcome by Chan and the doctor, Ross and Tomar are taken away by arriving police, led by Lt. Norman. Cutting open the dog collar, Chan reveals the $50,000 worth of smuggled diamonds. Sometimes pity, like precious pearl, dissolves in wine of truth. I have often observed that a simple rock sometimes conceals a valuable vein of gold. You don't buy a book because of its cover. A smuggler with a police record is like a banker without money. Small boy too young to realize age gap never narrows.